Quiet roads followed by farm and forest tracks, then a section of rough ground, before returning to forest track and roads for the final 5km. 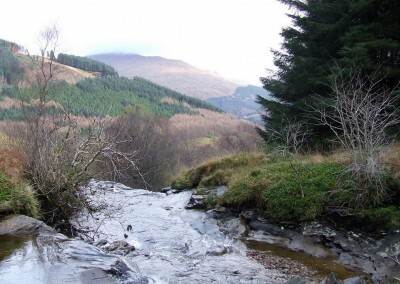 This section includes some challenging uphill terrain and small streams. 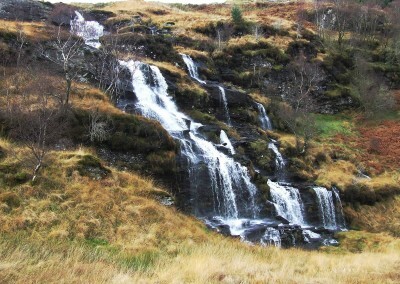 However, the rewards are the rugged postcard scenery, a remote hilltop loch, and dramatic views of the Sruth Ban falls. 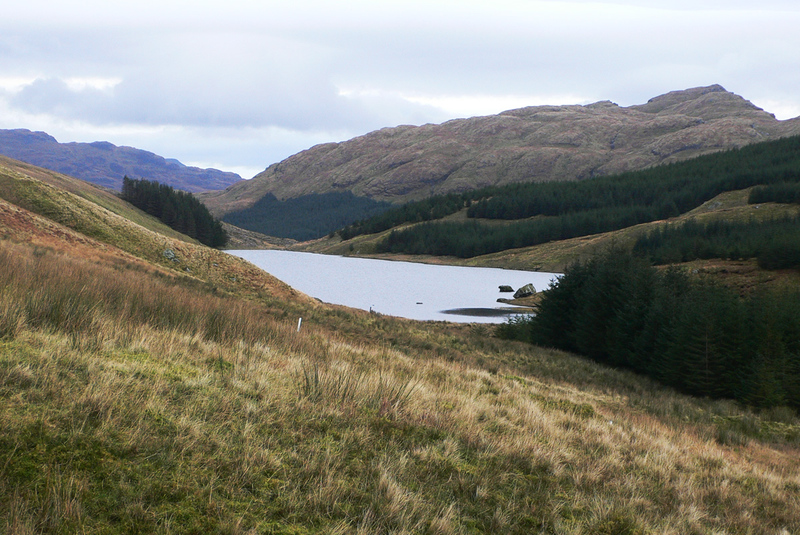 Start at the point where the previous section of the Loch Lomond & Cowal Way meets the A815, just east of the last houses in Strachur. 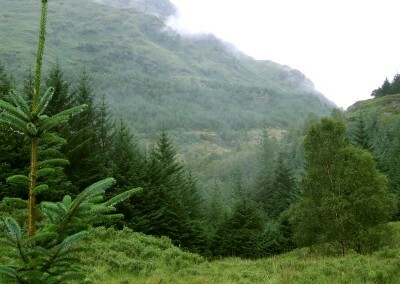 From here the route crosses the A815 diagonally to the right to head up the minor road opposite. Follow this road until you come to a junction on the left signed for Succoth Farm. The route take this road through the woods, ignoring the forest track that bears off to your left. 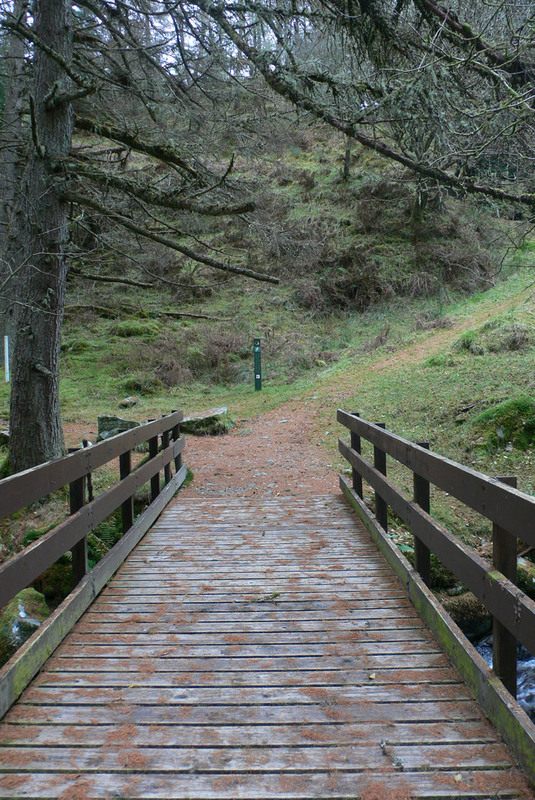 After the road crosses the River Cur, the Loch Lomond & Cowal Way leaves the road and bears right to cross second wooden bridge. 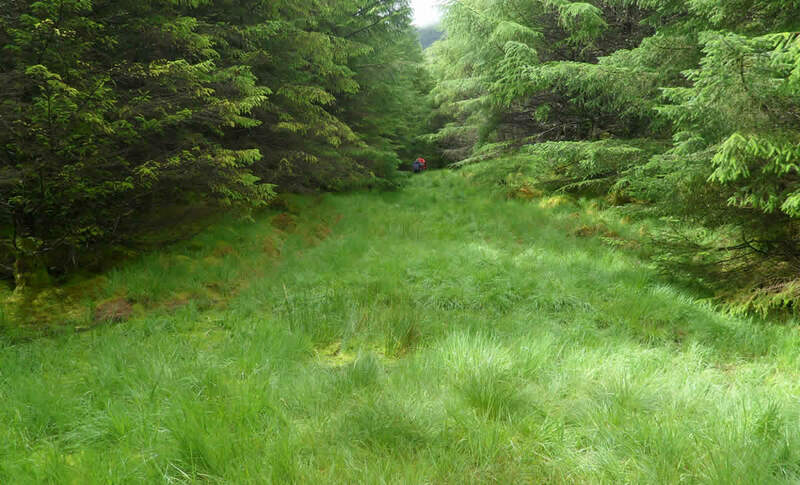 Continue straight ahead through a gate and follow the ahead track into the woods. Head straight on when it meets a larger forestry road. Keep on this main route, ignoring two smaller tracks joining from the right and then left. Continue straight ahead at a turning circle and watch for the marker post showing the turn to the left onto another section of forestry road. Follow this until its end, and then continue onwards on a rough track. 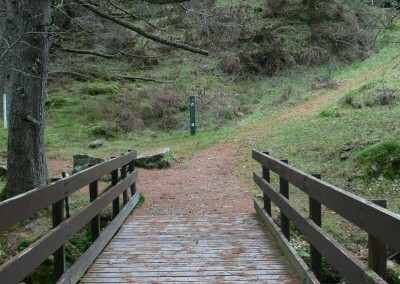 This track will lead across a small stream and through a gate before petering out after about 250m. 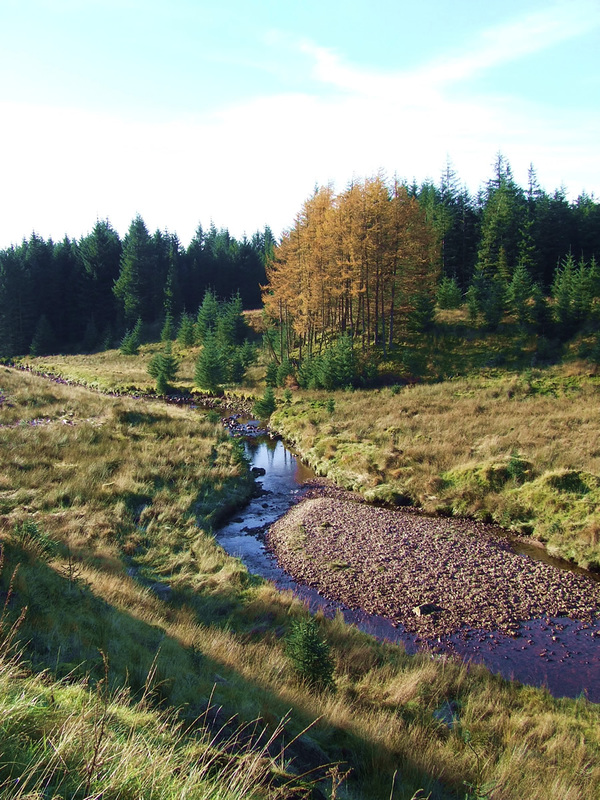 Once the track fades away, bear left to reach the edge of the Leavanin burn. 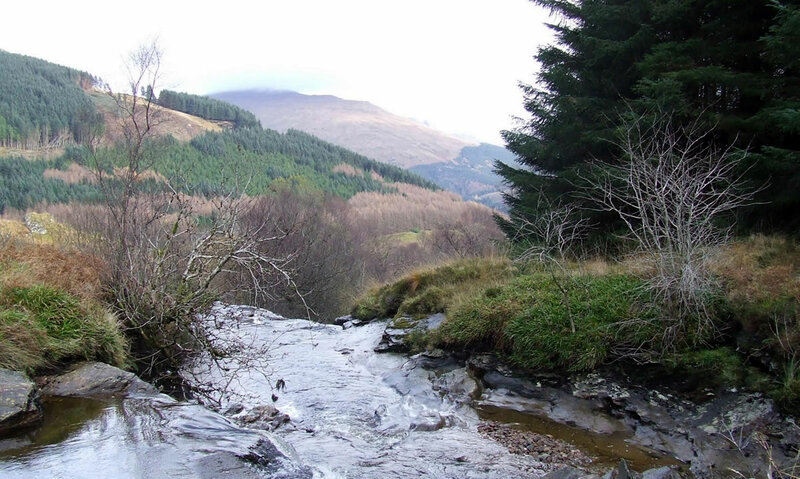 Follow the bank upstream for around 100m and then seek a safe place to cross. If in doubt, go higher. 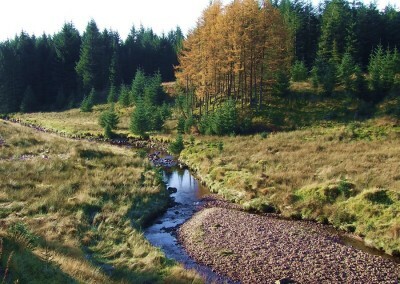 Once across the burn, head right between the stream and the trees aiming for a white post up ahead. There are faint vehicle tracks showing the way. 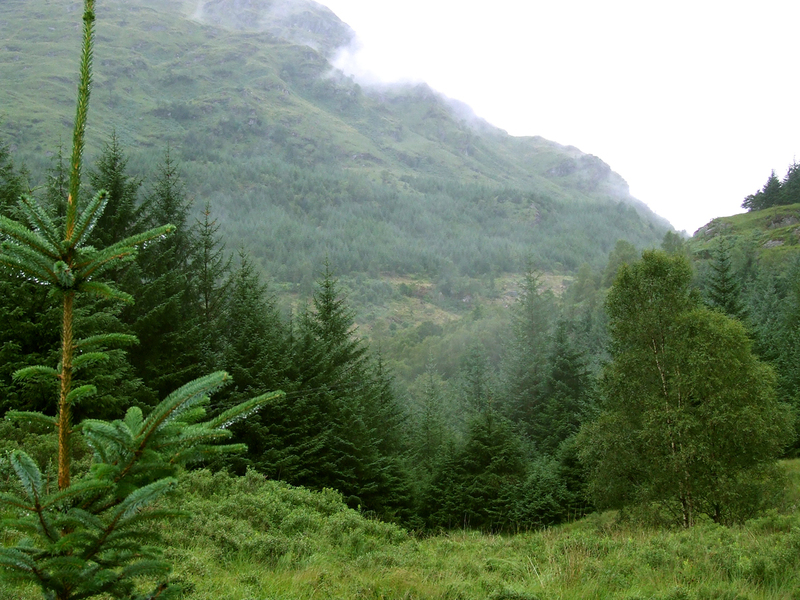 When you reach the post, and before the forest descend to meet the burn, turn left up a wide gap in the trees. 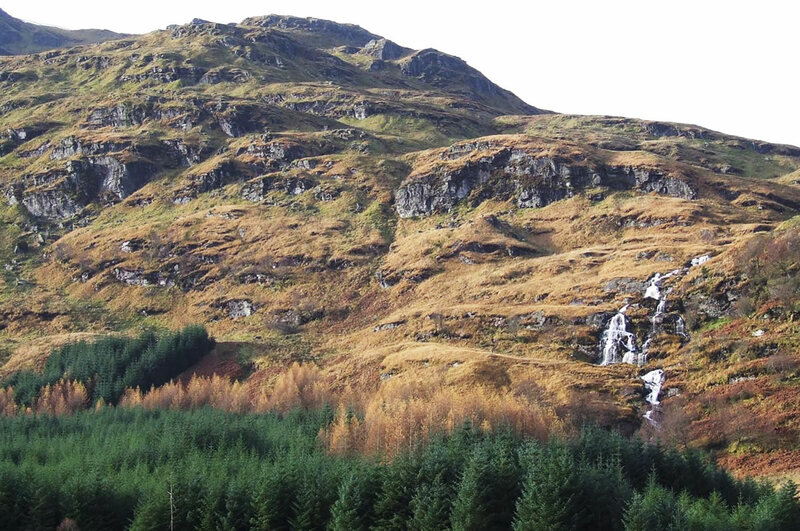 At the top of this ride is a swing-gate and Loch Lomond & Cowal Way markers. Through the gate turn right and head along the open hillside parallel with the fence line. White marker posts by the fence indicate the route. 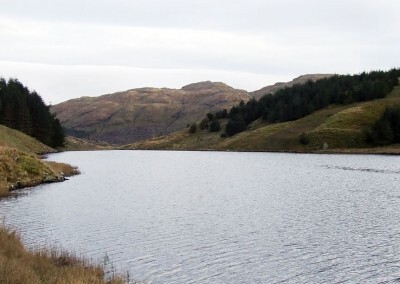 Continue straight ahead until you reach Curra Lochain, and then follow the left hand shore to the head of the Loch. 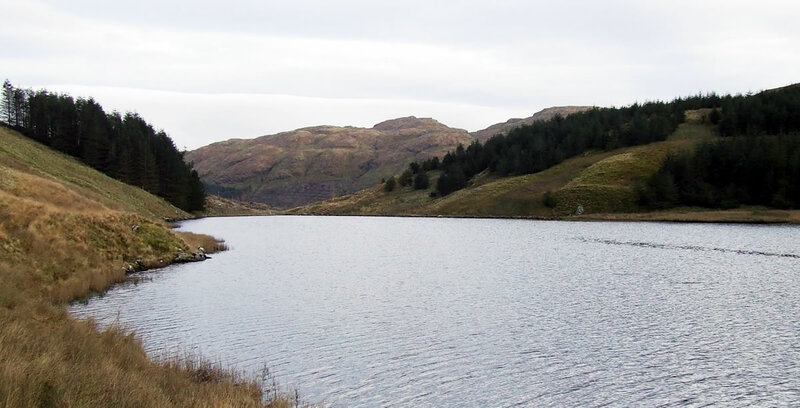 Just before a stand of trees, walk through the swing-gate to reach the outflow of the loch. Choose carefully where to cross this burn, especially when in spate. Once across turn left and follow the faint path by the fence-line. 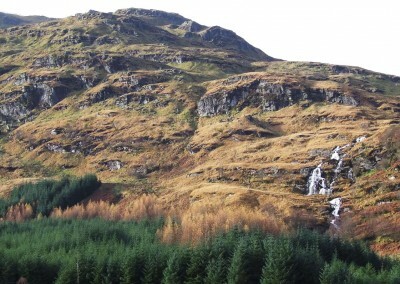 At the top of the Sruth Ban falls the path swings to the right and zig-zags down the hillside, indicated by white marker posts. 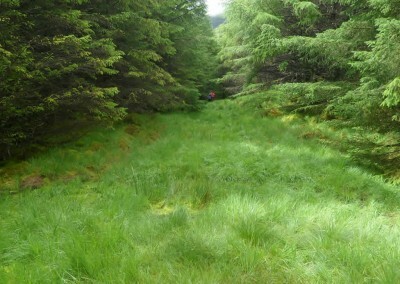 The route then continues on easier ground to head towards a clearer path straight ahead through a gap in the forestry. This path soon reaches a track. 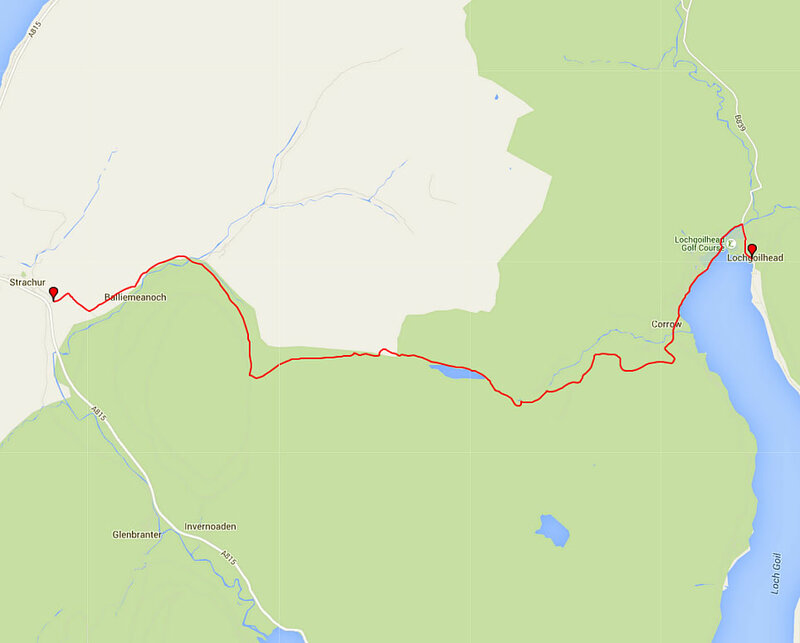 The Loch Lomond & Cowal Way now turns right along the forest road, then turns left at the first junction to head downhill. Continue downhill for around 2km, ignoring a smaller track to your left. 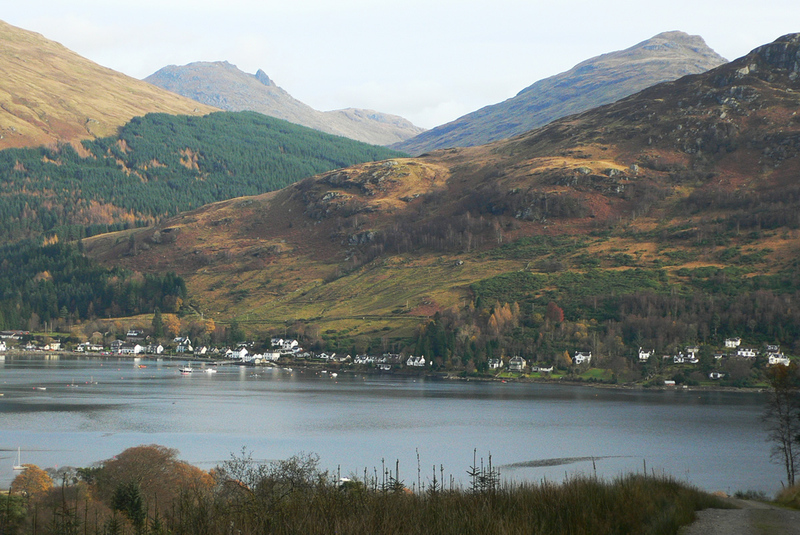 Soon there are views down over the water and to Lochgoilhead at the end of the loch. Ignore a turning up to the right and continue down to the gate for Lettermay forest. 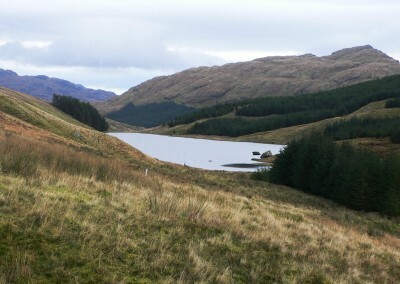 At the bottom of the track, bear left onto a road which leads past houses to the main road. Turn left and follow the road for 2km past chalets and caravans. To reach Lochgoilhead village centre, follow the road to its junction with the B839 and then turn right. At low tide a more attractive option is to take the footbridge over the River Goil, continuing along the footpath and then the beach.